I got back from my little change of scene late on Friday night after a series of annoying delays. Time seems to have curiously expanded since then - I can't believe my journey was only two days ago and that yesterday I was eating these after carefully transporting a few in my luggage. It was a wonderful trip - lots of lovely food, old movies and relaxing with my mum and dogs (and lots of work on my essay, unfortunately). These were one of the things we baked from a book I gave my mum for Christmas and have been lusting after ever since - Green & Black's Ultimate. 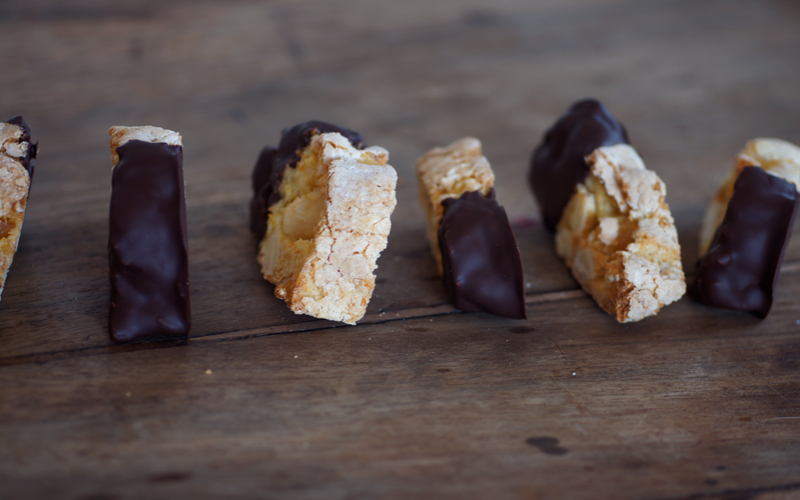 The recipe is quite different to the Dark Chocolate and Almond Biscotti I made a few months ago and behaved very differently too. This one doesn't have any butter added. I made a few changes which are reflected below - mainly swapping in zest/juice and orange blossom water for orange essence and not adding things to the chocolate. I halved the recipe too which is reflected below, though I would definitely recommend doubling for the full batch! I found my loaf wasn't fully cooked inside at the recommended time so I've increased it - as mine were already cut I increased the second time instead. 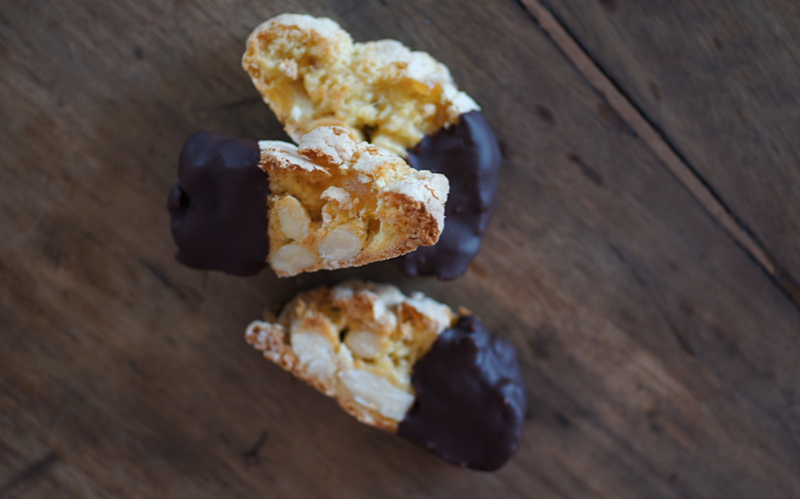 I really enjoyed these - they're chewier than other biscotti I've tried but I liked that. The flavours are delicious and the dark chocolate contrasts beautifully (though I loved them plain too). I adore the stem ginger with orange blossom water - such a beautiful pair, both in taste and smell. Preheat oven to 180C. Line a tray with baking parchement. Sift flour, baking powder and sugar into a bowl and mix. Stir in almonds, ginger, egg, zest, blossom water and orange juice until thick dough (I had to beat it to make it come together). Sprinkle a surface with icing sugar and roll into a log in the sugar (or two if doubled). Place onto the tray and squish slightly. Place in the oven for 25 minutes until golden brown. Leave to cool for five minutes then slice with a sharp knife into 1cm bits (I used serrated) - you can cut at an angle the traditional way or straight. Place back onto the baking tray and bake for 3-5 minutes. Take out and leave to cool on a wire rack. To coat with chocolate, melt in a bowl over a bain marie or in the microwave until smooth. 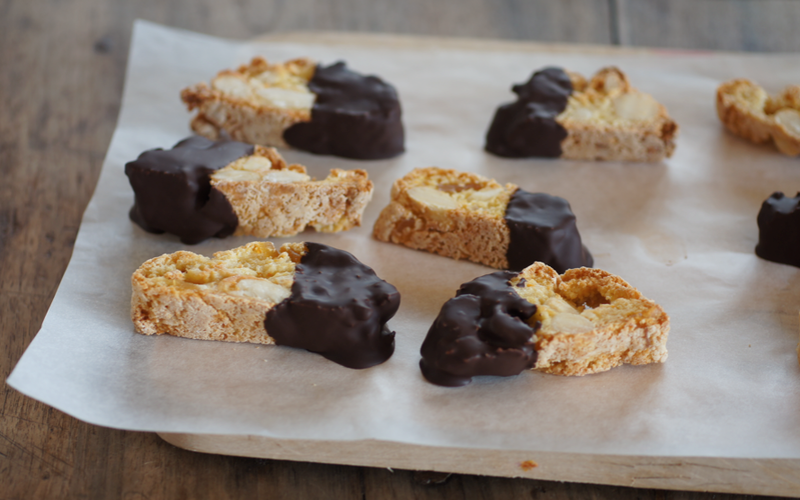 Spoon and smooth the chocolate over half of each biscotti. Place onto greaseproof and leave until it has set. Ooh, they look beautiful. The combination of orange flower water and ginger sounds delicious. 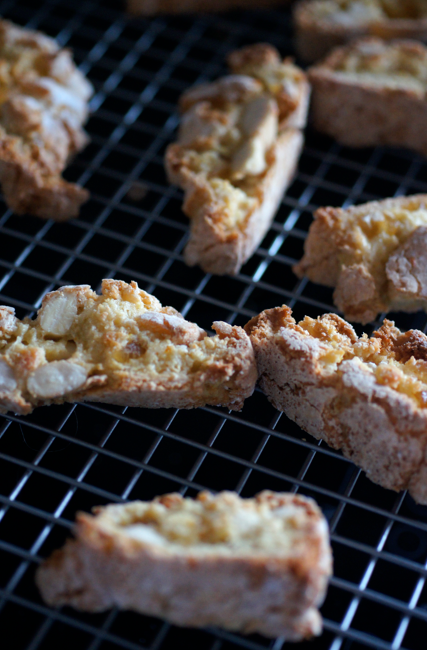 I've been looking for a butter free biscotti recipe so I'll definitely be giving these a go soon. Ooooh. My god. I did not know Green & Black had a cookbook. This is a life altering moment. I think I might cry. Cannot wait to try this recipe!